Em Stafrace| Just a Girl with Ideas: A little Pink Tractor and Mid 19th Century Inspiration! A little Pink Tractor and Mid 19th Century Inspiration! I mentioned in my last post the wonderful work of Sheree (a fellow Gold Coastian), who gave me the go ahead to scrap lift one of her recent LO's. Sheree's designs are so clean and well thought out that I find them really appealing. Here's my attempt at using one of her designs called 'CHATTERBOX!' as a template. Now mine pales into oblivion compared to her work but I am so happy with how it turned out. Me at 18months, am loving the little floral and mushroom motifs on my dress! 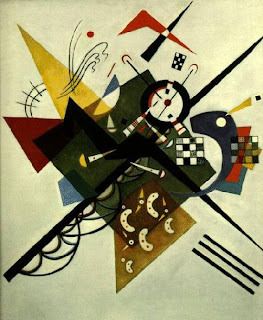 I also have completed a page for the September ARTastic Challenge; the theme being Wassily Kandinsky an amazing artist during the Mid 19th Century. Oh my...Em I LOVE your version of my layout... it's absolutely gorgeous!!! I love the colour combo and those embossed letters...it's fantastic!!! Mwah! 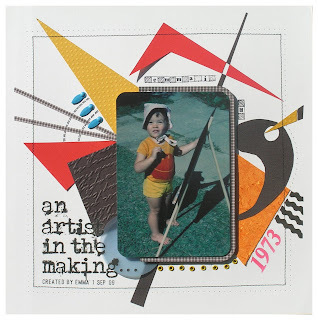 That layout you've done for the ARTastic challenge is just amazing!! You're one very clever gal!!! As per usual Em, just adore your layouts and artistic talent hun, YOU ROCK!!!!! 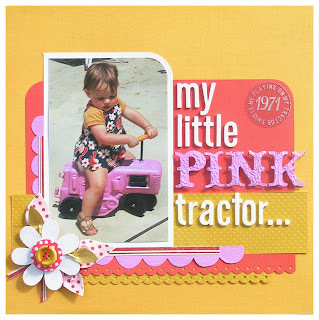 Love the "My little pink tractor" layout, just gorgeous and also your version of the artistic challenge is stunning.